WHEELS: 16" X 6.5" STYLED STEEL (STD), TRANSMISSION: CONTINUOUSLY VARIABLE TRANSAXLE II -inc: AutoStick Automatic Transmission, Tip Start, TIRES: P205/70R16 BSW AS (STD), QUICK ORDER PACKAGE 24A -inc: Engine: 2.0L I4 DOHC 16V Dual VVT, Transmission: Continuously Variable Transaxle II, POWER VALUE GROUP -inc: Body Color Door Handles, Illuminated Entry, Speed Sensitive Power Locks, Keyless Entry, Automatic Headlamps, Power Heated Fold-Away Mirrors, Power Driver 1-Touch Windows, Body Color Liftgate Applique, GRANITE CRYSTAL METALLIC CLEARCOAT, ENGINE: 2.0L I4 DOHC 16V DUAL VVT (STD), DARK SLATE GRAY, PREMIUM CLOTH BUCKET SEATS, AIR CONDITIONING, Wheels: 16" x 6.5" Styled Steel. 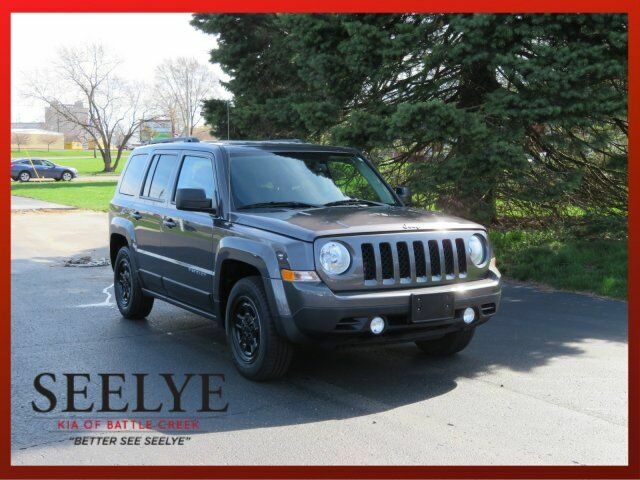 This Jeep Patriot has a dependable Regular Unleaded I-4 2.0 L/122 engine powering this Variable transmission. Variable Intermittent Wipers, Uconnect w/Bluetooth Wireless Phone Connectivity, Transmission: 5-Speed Manual T355, Touring Suspension, Tires: P205/70R16 BSW AS, Strut Front Suspension w/Coil Springs, Streaming Audio, Steel Spare Wheel, Sliding Front Center Armrest w/Storage, Single Stainless Steel Exhaust, Side Impact Beams, Sentry Key Engine Immobilizer, Roof Rack Rails Only, Rear Cupholder, Rear Child Safety Locks, Radio: 130, Radio w/Clock and Voice Activation, Premium Cloth Bucket Seats, Outside Temp Gauge, Outboard Front Lap And Shoulder Safety Belts -inc: Rear Center 3 Point, Height Adjusters and Pretensioners.